Music Hat Trick is the brain child of our youth ambassador, Calvin Glen. 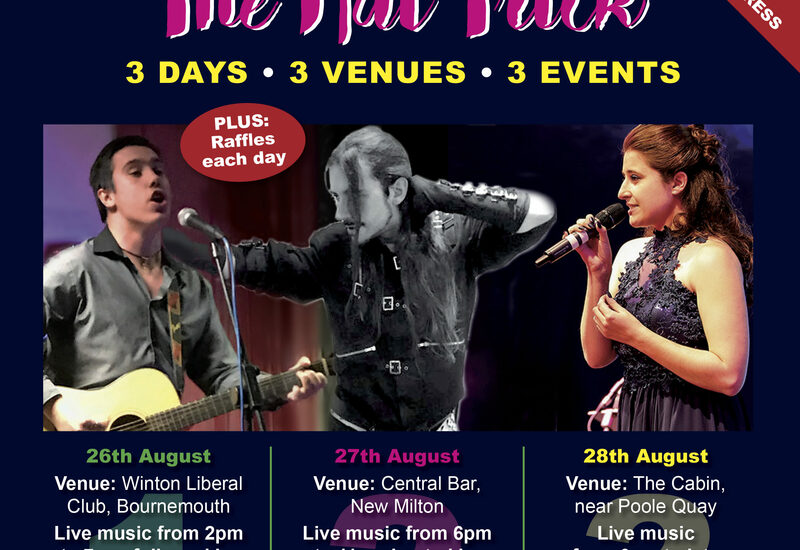 Yet again, Calvin has created a fundraiser with a difference… and a strong emphasis on live music and entertainment from some of Dorset’s finest musicians. It consists of three events, taking place across three venues, on three days. The ethos of the August Bank Holiday extravaganza is very much a celebration of Autism and Asperger’s, good mental health, and recovery from mental ill-health. The first event will take place at Winton Liberal Club on Saturday 26th August, from 2pm until midnight. The event has a rock ‘n’ roll 50’s and 60’s theme. There will be a showcase of live music and fun entertainment in the afternoon. The evening will start with traditional bingo, and then it is party time with a DJ providing the tunes. So get your groove on and come and join us shifting some shapes to the music on the dance floor. 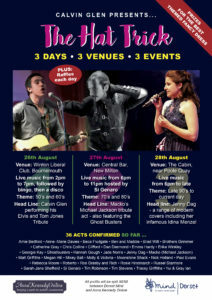 The 2nd event takes place at The Central Bar in New Milton on Sunday 27th August, from 6pm to late. Sunday has a classic 70’s and 80’s theme, and an Open Mic will be hosted by local music legend Si Genaro. And finally the event draws to a close on August’s Bank Holiday Monday at The Cabin Bar near Poole Quay. Monday’s theme is a fine selection of chilled acoustic music from the 90’s to current day. So, what can I expect to see? There will be prizes for the best fancy dress based on the decade theme for each venue. There will also be raffles, tombolas, and child/adult lucky dips. A selection of buffet food is available on Saturday and Sunday for a donation to charity. The event is family friendly and has FREE entry to all venues – but we ask for a donation to charity on the door. Donations will be divided between Dorset Mind and Anna Kennedy Online, an Autism/Asperger’s Charity. Thanks Calvin – it looks like another brilliant fundraiser! You can find out more about the event on the Facebook Page. Place: Winton Liberal Club, Bournemouth, BH9 2AP. Place: Central Bar, 50-52 Station Road, New Milton, BH25 6JX . Place: The Cabin, 1 Old Orchard, Poole, BH15 1SD .